After planning to lower the retirement age for the Japanese to 40 to compete with developing countries on wages, now he says he will nationalize the islands disputed by Japan, China, and Taiwan. Why? He thinks that will win him the next election. Absolutely tone-deaf, harebrained move by the prime minister who seems to be rather popular in the US and UK (particularly among the financial media) for his resolute moves to combat fiscal deficit by raising taxes and cutting social welfare for the hapless citizens. The move may give more headaches for the Chinese Communist Party who has been battling the unrest cropping up in the country, and cause the Chinese government to appease the angry public by instituting some anti-Japanese measures. As the Nikkei article below indicates, Noda's move is to prop up support for him and his party in the next Lower House election. By appearing tough, he thinks he can get the right-wing votes, I suppose. The national government is moving toward nationalizing Senkaku Islands. Inspired by Governor of Tokyo Shintaro Ishihara, who has already to purchase the islands, Prime Minister Yoshihiko Noda overcame the faction inside his government who are more cautious. The purpose is to deflect the criticism of "being weak-kneed" and to create an image of a resolute leader protecting the national border, in preparation for the next Lower House election. The prime minister [and his supporters, if any?] is prepared for the opposition from China. This decision may worsen the relationship between Japan and China. Minister of Foreign Affairs Koichiro Genba told the press corp at the Ministry on July 7 that China and Taiwan had contacted his ministry to explain the situation. July 7 marked the 75th anniversary of Marco Polo Bridge Incident [in 1937) that triggered the [Second] Sino-Japanese War. Chinese diplomatic sources say "It's the worst possible timing." Shintaro Ishihara says his purchase plan with donation money is still in place. As of July 5, 2012, he has collected 1.325 billion yen (US$16.6 million) from nearly 90,000 entities. Independent journalist Ryusaku Tanaka tweets he's at Fukushima Prefectural Government Building in Fukushima City. People gathered there are shouting "We don't need nuke plants!" Prime Minister Noda is visiting the governor of Fukushima at his office there today. Meanwhile, the general manager of the antenna shop in Edogawa-ku, Tokyo that sells agricultural produce from Fukushima says he will drive the sales as hard as he can, paying close attention to quality, according to Jiji Tsushin. Uh huh. The Jiji article did say he asked the wholesalers to conduct the test for radioactive materials last year. No word about this year. And we know how the wholesalers' testing goes. Miyagi prefectural government announced on July 6, 2012 that 3,300 becquerels/kg of radioactive cesium was detected from black seabream caught off the coast of Higashi Matsushima City in Miyagi. That is extremely high, even compared to last year. Miyagi's governor continues to ship disaster debris outside the prefecture even when his own Assembly says the debris should stay inside Miyagi, and he continues to support fishermen without spending much or doing much on testing the catch for radiation. Nikkei Shinbun says the government committee on national strategy (chaired by Prime Minister Noda) has compiled the report on the government's long-term strategy called "Frontier Plan". What's in the "Frontier"? Japan is indeed going where no one has gone before. Noda and his people want to make the retirement age at 40, with the retirement money of 1 to 2 years worth of salary. Why? To make employment more mobile, to compete with developing nations. They want to eliminate the distinction between contract workers and full-time employees - i.e. cutting the benefits for full-time employees. In their mind, this somehow will translate into (hold your breath).... birthrate increase. How will an extremely insecure employment with the developing country-level wage lead to the increased birthrate? It won't, except in Noda and his experts' minds it will. Oh, and the baby Panda is male, says NHK. after he transmitted TEPCO's shareholders meeting via audio using his smartphone on June 27, 2012. At that meeting, the company officially became the ward of the state (well, "effectively"), and the state that "effectively" took over is in turn barely sustained by the taxpayers in Japan, now and the future. Ryuichi Kino has been attending the TEPCO press conferences since March 17, 2011, asking questions which often didn't even occur to the reporters at established media outlets and TEPCO managers alike. He wrote a book with Kazuo Hizumi, who also attended the TEPCO press conferences from the beginning despite his terminal gallbladder cancer which finally took him in June this year, detailing their efforts to wrestle information out of TEPCO on the Fukushima accident. Kino has been barred from attending TEPCO's press conferences since June 27, 2012. The emergency emails to Kino from TEPCO for the journalists who cover the Fukushima accident have also stopped. The reason is that Kino was transmitting the audio of the shareholders' meeting on June 27. TEPCO had explained that the recording of audio and video at the shareholders' meeting would be prohibited, and that anyone who violated that rule would not be allowed to attend the press conference any more. So accordingly TEPCO banned Kino after finding out about his transmitting the audio of the shareholders' meeting. Kino had asked TEPCO before about netcasting the shareholders' meeting. On June 26, TEPCO's Matsumoto said in the regular press conference that the company had no intention of making the shareholders' meeting public because it was the place to discuss [issues] with TEPCO's shareholders. Chairman Katsumata declined to vote on the motion [last year?] to allow NHK and Nico Nico to do a live broadcast/netcast, saying he didn't think it was necessary. Kino takes these to mean that this so-called "rule" is not a legally-binding prohibition, but it simply says TEPCO doesn't think it's necessary to make the shareholders' meeting public. Kino thinks TEPCO is exercising media censorship. It seems Kino was fully aware of this TEPCO's private rule and deliberately disobeyed the rule. Why? Kino asks, "Does it make sense?" Does it make sense for TEPCO to have the shareholders' meeting closed to the public, when close to 1 trillion yen worth of taxpayers' money, aka public fund, has already been given to the company, and in July another 1 trillion yen will be poured by the government to effectively take over the company by controlling the majority? Any information related to TEPCO now affects the entire nation. Shouldn't such information be made readily available to the public? As part of that information, I believe the shareholders' meeting, which will significantly affect the operation of the company, should be broadcast live, just like the regular press conferences. I cannot agree more. Besides, many ordinary people may be indirect owner (=shareholders) of TEPCO through mutual funds, through the holdings by the municipal governments (like Tokyo Metropolitan government who is one of the largest shareholders of TEPCO). Yet many more may be stakeholders through the bonds and bond funds that they own, as TEPCO's corporate bonds had been considered one of the best, safest investments until March 11, 2011. TEPCO's PR manager under Matsumoto had the temerity to thank Kino for having attended the press conferences for such a long time, after TEPCO told Kino that he wasn't allowed at the press conference any more. Perhaps a sign of the slowly changing times, Asahi Shinbun has an article about this incident. Tokyo Shinbun's article says it is unconscionable what TEPCO has done to Kino, and even if Kino broke TEPCO's rule, the shareholders' meeting of a company that is being effectively nationalized should be made public, as well as any information concerning the company. Some comments at Kino's blog post are nastier than the mainstream media reports. Agents hard at work, some say in the same comment section. The spot that measured 4.7 sieverts/hour last year measured even higher this time (No.21 in the table below): 5,150 millisieverts/hour, or 5.15 sieverts/hour. There are several other locations with radiation levels easily exceeding 1 sievert/hour at 150 centimeters off the floor. In general, the radiation levels at 150 centimeters off the floor were SIGNIFICANTLY HIGHER than those at 15 centimeters. No place for carbon-based workers. There's also a video, clearly edited, and very bad. I'm downloading it just for the record, and will post it here later. On July 5th 2012, Anonymous published 1.2 Gigabyte of internal data from IT-service company Innodata Isogen. In total there is 40 Gigabyte to be released, including communication between top management of business data provider Thomson-Reuters which has yet to be disclosed. The initial batch of leaked material mostly contains documents from the International Atomic Energy Agency (IAEA), in particular regarding the development of a nuclear infrastructure in Vietnam. These files include English and Vietnamese documents, scans of diplomatic passports and complete information about key personell like the Vietnamese Vice Minister of Science and Technology and Director General of the Agency for Radiation and Nuclear Safety. At this moment we decided against mirroring the entire dump to avoid overwhelming information. Instead we start by presenting selected material that we consider interesting, most notably documents from IAEA and The U.S. Nuclear Regulatory Commision (NRC) about the 2011 nuclear accident at the Fukushima Daiichi Nuclear Power Plant. This material is not necessarily classified but nonetheless interesting. We plan to publish all relevant material from the Innodata dump related to Fukushima Daiichi as collected information since it is unknown whether all of this information has already been disclosed to the public or will remain publically accessible. Check back on this site for new documents, the latest entry will be on top. IAEA Draft: Environmental Issues in New Nuclear Power Programmes. The police this time says 21,000 people, up 4,000 from their last week's estimate of 17,000. Organizers say 150,000, about the same level as last week. Participants (or would-have-been participants) say many more were stopped at the subway station (Kokkaigijidomae) exit and couldn't get out. Citizens' groups demanding the halt of operation at KEPCO Ooi Nuclear Power Plant (in Fukui Prefecture) which restarted power generation on July 5 conducted the protest action in front of the Prime Minister's Official Residence in Nagata-cho, Chiyodaku in Tokyo. According to the Metropolitan Police, the number of participants rose to about 21,000, and there was a 800 meter-long line in front of the Official Residence. People including young people who gathered there via Twitter and Facebook messages shouted "Saikado Hantai (we're against the restart)", waving signs like "Listen to us citizens". A small group of participants started to march toward the PM Official Residence after 8PM, the time that the protest action was scheduled to end, and there was a minor scuffle between the group and the organizers and the police, who together tried to restrain the group. A housewife (aged 35) from Ota-ku, Tokyo who came with her two sons (aged 8 and 3) said, "[I came because] I thought I had to clearly express my view against nuclear power plants, in order to protect children." That small group who pushed to the front after the protest hours was one of the long-time established left groups, according to the participants who witnessed the scuffle. The group, who tried to make a scene, according to the witness account, was restrained by both the organizers and the police. If you recall, this is the newspaper who allegedly said they wouldn't cover the protest because it was against the paper's policy and stance. What's interesting is that more and more senior politicians are showing up at the protest. Shizuka Kamei was one example. He is the ousted former head of the ruling coalition party People's New Party, or Kokumin Shinto. Though he was ousted in the party "coup" in March this year, he seems to carry weight as an "insider". Many people know him as a former police and security official with ties to nuclear industry, making his appearance puzzling or troubling for some. It turns out that Kamei's elder sister died of leukemia, after suffering from the radiation exposure she received in Hiroshima City when the atomic bomb detonated. Kamei said in this interview that his sister, who was in high school at that time, repeatedly went back to the city center with her classmates to help people suffering the effect of the bomb. To be anti-nuclear or anti-restart of nuke plants may be getting to be perceived by some politicians as a vote getter. Good sign, I think. Protests against the restart of Ooi Nuclear Power Plant have been happening outside Tokyo, too. The largest outside Tokyo is the protest in front of Kansai Electric (KEPCO) Headquarters in Osaka City. The number of people participating in the protest is steadily growing there. This week's 2,700 is up 500 from last week's 2,200, which was up 700 from the previous week. In Tokyo, the number of people who came to protest despite the rain was 150,000 according to the organizers (not bad at all), and 21,000 according to the police (they upped the number from last week's 17,000). Apparently many more were barred by the police from going out from the Kokkaigijidomae subway station exit. It's cloudy, may be raining a little. I have no idea how many people are showing up, but the police and the mainstream media seem more ready than last week. Some photographs being tweeted by the participants. The protest has just started officially. People are shouting "saikado hantai!". Yasuo Tanaka, head of the New Party Nippon (or Shinto Nippon), giving out white balloons (from @singo_mpc). I didn't even know he became a politician until last year after the Fukushima accident. All I knew of him was that he was a successful and popular novelist. Mizuho Fukushima, head of the Social Democratic Party of Japan, is also at the protest. Kazuo Shii, head of the Japanese Communist Party, is at her side. No sign of any politicians from DPJ, LDP, or Komei Party. Here's the site that shows 4 IWJ USTREAM channels that cover the protest. (UPDATE 2) Some photos and more video links in my latest post. (UPDATE) Shizuka Kamei, former head of the party (People's New Party, or Kokumin Shinto) that forms the ruling coalition with the DPJ, is going to join today's protest action in Tokyo at 6PM. Kamei is a former senior police officer. Last week, there were several heads of the small parties joining the citizens. People are already gathering, and the police seems more ready than last week. Following the last week's huge crowd (17,000 said the Police, 150,000 said the organizers, 200,000 said some newspapers), I'm not sure about the turnout, as there are clearly some disagreements now among major "people of influence" - organizers, anti-nuclear activists, journalists - as I mentioned in my previous post. I see more tweets this week worrying about some type of "agent provocateur" incident happening this time. But the protest is on, both in Tokyo and Osaka (in front of KEPCO headquarters), just like every Friday evening since March this year. Yasumi Iwakami's IWJ will be hiring a helicopter again, and dedicating all of their USTREAM channels to report on the protest. Please refrain from carrying political signs not related to "anti-nuclear". Please follow the general guidance from the organizers. The organizers warn that the nearest subway station, "Kokkai Gijido Mae" on Marunouchi Line and Chiyoda Line may be extremely crowded. People who show up at KEPCO's headquarters in Osaka City have been steadily increasing in number. Last week, the organizers there said 2,200 people showed up, up 700 from the week before. One of the people I follow on Twitter is a nuclear researcher in Shikoku, Japan. He made an interesting observation regarding the number of people at the protests, particularly in Tokyo in front of the PM Official Residence. He said (I'm paraphrasing him), "It doesn't really matter exactly how many showed up. If they managed to convince the media that it was 45,000, or 150,000, or 200,000, that all it matters. These numbers will be reported, and these numbers will stay in people's memory. That's the whole point of "demonstration" - to pressure the authority into believing the opposition is much bigger than actually is, and people have succeeded." If you're going, be careful, and please report in the comment section. Independent journalist Ryusaku Takana does warn that the "tired old left" dreaming of riding the storm again like in 1960s are trying hard to usurp the movement and claim as their own, and he tells the protest participants not to be easily persuaded by their tactics. Now, young women from Canada under the age of 20 are joining the US high school students and college students doing the cleanup volunteer work in Tohoku including Fukushima and the US decontamination businesses in dispelling the "baseless rumors" and making an appeal to the world that "Fukushima is safe" (as US Ambassador to Japan John Roos said). Women's World Cup Soccer [or football for European readers] under the age of 20 will be held in Japan next month. To support the recovery, a friendly match is planned between the Japanese team and the Canadian team in Fukushima City. The venue for the match must be the Shinobugaoka Athletic Field in central Fukushima City. The radiation level at Shinobuyama Park, about 500 meters west of the athletic field, is shown in the photo above as "1.517 microsievert/hour". The radiation level at the athletic field should be lower, because there are no trees shedding leaves on the athletic field and the city must have done some "decontamination" in November last year (I hope) when the women's Ekiden road race, also under the age of 20 event, was held in the city. There were rumors of agitators at the June 29 protest at the Prime Minister's Official Residence in Tokyo where a great number of people (between 17,000 and 200,000, depending on who you ask) gathered to protest the restart of Ooi Nuclear Power Plant. There were also rumors of certain people behind the protest (certain large PR agency in Japan, for example). Recently, there have been people who strongly advocate violence as a way to attract more attention to their anti-nuclear (or anti-Noda administration) causes. There are also people on Twitter who seek to remove certain "elements" from the protest (one of their target seems to be Mr. Kouta Kinoshita and his followers, for some reason). There are rumors that some of the organizers of the Tokyo protest are in favor of accepting and burning the disaster debris that are contaminated with radioactive materials. Now, what may be a sign of radicalization is happening. Yomiuri Shinbun reports that a man was arrested on July 1 for trying to stab himself in protest against the restart of Ooi Nuke Plant. It has been revealed by talking to persons whose duties involve investigation that the Metropolitan Police arrested a man on July 1 on suspicion of violation of the Swords and Firearms Control Law (illegal possession of a knife) on the scene of the protest against the restart of KEPCO Ooi Nuclear Power Plant in front of the Prime Minister's Official Residence in Chiyoda-ku, Tokyo. The man is exercising the right to remain silent. According to our source, the man took out a fruit knife from the bag in front of the PM Official Residence in the evening of July 1. The riot police subdued him. The man allegedly said at that time, "I was going to stab myself in protest." If such a thing actually happens, I think it will instantly turn off the majority of people protesting. This man could be a plant to split up the opposition to the restart of Ooi Nuke Plant, to nuclear power in general and to the Noda administration. He could well be genuinely frustrated enough to do what he said he wanted to do. It is inevitable that some young people with too much energy get radicalized soon and resort to direct action. There will be cases where the senior members of TEPCO and Democratic Party of Japan are attacked. There will be people who will call these young people radicals and exclude them from the movement, which will then split into pieces. But that is OK. The movement should split up, and proceed with many, different intentions [or purposes] and in various formats. We'll see. I am still hoping that Japan, having always been very good at adopting foreign ideas and products and improving on them, can somehow improve the way the "revolution" progresses, if it is a revolution they want. The troubled fast breeder that has cost a fortune just to maintain (sort of) over the past 30 years is now ready to restart, after the IVTM (In-Vessel Transfer Machine) that had fallen into the reactor in August of 2010 was finally removed in June last year after two failed attempts. Just like Ooi Nuclear Power Plant (and couple of other plants in the same area), Monju is accessible by land by only one road, which ends at Monju. There are faults running under the plant, as the Nuclear and Industry Safety Agency says it will review the faults in and around all the nuclear power plants in Japan. NISA is on the way out, as the regulation of the nuclear industry will fall on the yet-to-be-created regulatory agency and adjunct commissions of experts and politicians. Remember also that this reactor uses liquid sodium as coolant, which ignites on contact with air. Fast breeder "Monju" (in Tsuruga City, Fukui Prefecture), whose operation has been suspended due to numerous problems, is expected to be fully restored in mid July. Japan Atomic Energy Agency (JAEA) showed the restoration work to the press on June 21, demonstrating the equipment, newly installed after the accident [of the IVTM dropped inside the reactor], operated normally. At Monju, the In-Vessel Transfer Machine that is used to replace nuclear fuel fell inside the reactor in August 2010, and the test operation was halted. The plan was to restart the operation by the end of March this year, but the restoration work has taken longer. On June 21, as the workers at JAEA and the plant manufacturers looked on, two personnel from the Japan Nuclear Energy Safety Organization (JNES) confirmed the newly replaced IVTM worked. They will confirm the operation of the electro-magnetic brakes attached to the control rods, and the test operation is set to resume in mid July. Monju's operation has been nothing but "test operation" for nearly 20 years (the reactor achieved criticality in April of 1994), and for the most part it has been idle because of seemingly endless problems. The biggest of all was the leak of liquid sodium coolant that resulted in fire at the plant in December of 1995, but what was at issue was not so much of the fire incident itself. The Power Reactor and Nuclear Fuel Development Corporation, who was running the plant at that time, downplayed the accident and hid the information of the accident. More than anything else, the loss of credibility was what stopped Monju operation until March 2010, when the NISA deemed the reactor was "appropriately safe". The governor of Fukui set about restarting the plant. It reached the criticality in May 2010, only to have the IVTM dropped into the reactor 3 months later. In fact, they may be inside the reactor building as of now, on July 4, 2012. TEPCO is sending all the survey robots it has in its possession - Quince No.2 and two Packbots from iRobot - probably to conduct the survey in the area of the Reactor 1 building 1st floor where the company is planning to drill holes to conduct an endoscope survey later to probe inside the Containment Vessel (like it has done in Reactor 2). In June, TEPCO's human workers entered the basement to measure the water levels and temperatures. Near the surface of the water, the radiation level was 10.3 sieverts/hour. "Fukushima Daiichi Nuclear Power Station Unit 1 Reactor Building First Floor TIP Room and South Area Inspection (July 4, 2012): Scheduled Access Route for the Robot"
Beautiful collaboration, in the area where the highest radiation level measured was 4.7 SIEVERTS/hour. I wish them luck. 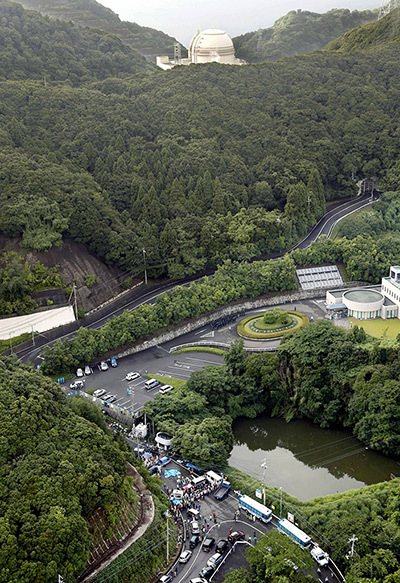 Die Müllverbrennungsanlage in Maishima (Osaka/Japan) ist ein Kunstwerk vom österreichischen Künstler Friedensreich Hundertwasser, der zu seinen Lebzeiten ein heftiger Gegner der Kernenergie war. Die Stadt Osaka plant, ab diesem Herbst dort Tsunami-Trümmer aus Iwate, die radioaktiv verstrahlt sind, zu verbrennen. Durch das Verbrennen radioaktiv verstrahlter Trümmer wird dieses Kunstwerk zu einem Atomofen degradiert. Davon ganz zu schweigen, man darf verstrahlte Trümmer auf keinen Fall verbrennen. The incineration plant where they are proposing to burn the debris contaminated with radioactive materials from the Fukushima I Nuclear Power Plant accident was designed by Friedensreich Hundertwasser, a Austrian architect famous for his anti-nuclear stance. It's built on a landfill on Osaka Bay. It's just a bad juju after another. Water leaks, alarms going off along the power transmission lines, protesters preventing the government minister from entering the plant by land, and now this. The Reactor 3 turbine vibrates too much. Seishu Makino, Senior Vice Minister of Economy, Trade and Industry announced on July 3 that the start of power generation at KEPCO Ooi Nuclear Power Plant Reactor 3 will be postponed until the morning of July 5. It was scheduled in the morning of July 4. According to KEPCO, the vibration of the turbine is exceeding the value recommended by the manufacturer. UK's Guardian has an AP photograph of protesters and the police and the plant. The final access to the plant by land seems to be through the tunnel. You can't make that up. Following the news of Gundam fantasy by LDP politicians, Chubu Electric Power Company says it will ensure safety of nuclear power by having a nuclear safety lab inside Hamaoka Nuclear Power Plant, in order to ensure safety. Remember this plant sit right in the center of the expected Tokai earthquake zone, and the plant itself sits on earthquake faults. The plant is practically on the beach, and if tsunami comes it will be the reactor buildings that will be hit first, not the turbine building as happened in Fukushima. Remember that is the nuclear power plant that PM Kan ordered shut down for the time being in May last year after the Fukushima I Nuclear Power Plant. No one knows why exactly. Some alleged that it was the US government who pressured Kan to do so. Or maybe Mr. Kan watched a Godzilla movie in which the nuclear monster destroys Hamaoka Nuke Plant. Much like he worried about the massive evacuation that might be necessary for Tokyo Metropolitan region after reading a SF novel by Sakyo Komatsu, possibly. But that stopped Chubu Electric from restarting the plant in July 2011. (For more of the charade between Chubu Electric and the Oxford-grad governor of Shizuoka, see my post from May last year. On July 2, in order to do the utmost best in safety measures at Hamaoka Nuclear Power Plant (Omaezaki City, Shizuoka Prefecture) after the accident at TEPCO's Fukushima I Nuclear Power Plant, Chubu Electric Power Company newly opened the "Nuclear Safety Research Laboratory" inside the plant. 35 senior managers of Chubu Electric attended the opening ceremony. During the opening ceremony, Atsushi Ishida, general manager of the research and development department at Chubu Electric, made a speech. He said, "The result of the research will be shared with the local community and with the whole country, so that people can feel safe." Further, he challenged the researchers to continue to strive for safer Hamaoka Nuke Plant. Whatever that means. Jiji Tsushin has a picture of a Shinto priest purifying the place and praying for the safety and success of the lab, with Chubu managers and researchers bowing with him. The word for this in Japanese is "Kamidanomi (神頼み)" - praying to the gods, literally. Japanese Politicians Are Thinking about Building Gundam. Like, Real, Working Gundam. Politicians everywhere are crap—even the ones who are thinking about building a giant, working mecha. In an upcoming broadcast on Japanese video platform Nico Nico Live, members of Japan's Liberal Democratic Party are apparently going to discuss the idea of building a real life Gundam. The Liberal Democratic Party, which ruled Japan for over fifty years after World War II, is not actually "liberal". Rather, the party is conservative. As ANN pointed out, party members Masaaki Taira and Hideki Niwa are slated to discuss how the LDP is "seriously considering the development of Gundam." Back in 2008, it was estimated that a working (not just a full scale mock-up like above), one-to-one scale would cost US$725,000,000 for parts and materials. That figure doesn't include the cost of labor or the cost of insanity required to build such a machine. These politicians probably do not mean they want to make a 60-foot tall, 43.7 metric ton Gundam replica (at least I hope they don't), but instead, large mecha contraptions that could be used by, presumably, the country's Self Defense Force. In an age of drone attacks, however, mecha don't exactly seem ideal on the battlefield. Japan's economy and society are both in a bad way. The country is deeply in debt, the population is aging, and Japan has no natural resources. And with a strong yen and a sour world economy, Japan can't export its way to prosperity. It can ship its manufacturing to China and hollow itself out. These are serious times. They require serious conversations by serious leaders. And the LDP, who hopes to regain power after the current Democratic Party of Japan implodes, appears like its fishing for the nerd vote by appearing on Nico Nico and talking about building Gundam robots as a viable way to promote industry and protect the nation. And they think they will win over the DPJ in the next election, whenever it may be. Japanese citizens and residents, your taxes are paying for these people. Another minor incident at Fukushima I Nuclear Power Plant, this time in the basement of the turbine building for Reactor 6, one of the only two reactors at Fukushima that remain in cold shutdown in the true sense (not the definition by the Noda administration) after the accident. 7/2/2012 10:08AM After the maintenance of the air dehumidifier for the Compressed Air System (IA System) located on the first underground level in the Reactor 6 turbine building was completed and the air defunidifier was switched on, we noticed the white smoke coming from the IA System Control Panel. We immediately switched off the control panel for the air dehumidifier. We notified the fire department at 10:21AM. At 10:25AM, we confirmed that the white smoke had stopped. At 10:26, we found a burn at the transformer inside the control panel. Later, Namie Fire Department and Tomioka Fire Department did the site inspection, but the visual inspection of the exterior of the transformer didn't identify the cause. We will remove the transformer and investigate. This incident has no effect on the environment in terms of radioactivity. Update on the Asahi TV's copyright claim on TEPCO's video on my channel. TV Asahi Corporation has reviewed your dispute and released its copyright claim on your video, "Fukushima I Nuke Plant: Video of Inside the Reactor 1, 10/18/2011". Maybe I should alert TEPCO that Asahi TV was claiming the copyright on their video. This particular video has been viewed over 22,000 times. It is the footage of October 18, 2011 excursion by TEPCO workers inside the Reactor 1 building. More recently in Reactor 1, workers went to the 1st floor to measure the temperatures, radiation levels, and water depth through the gap on the floor. They measured over 10 sieverts/hour radiation 20 centimeter above the surface of the basement water. Surprisingly good coverage (I think) from a newspaper who only carried a short AP article when reporting on the June 29 protest in Tokyo. TOKYO — Protesters this weekend thronged the wide streets in front of the prime minister’s office in Tokyo, and across the country they gathered about a quarter-mile from the entrance of a nuclear plant. They shouted “No to the restart,” and parked cars in front of the plant’s access road, blocking workers from coming or going, according to Japanese media. But the workers were already inside. Sunday, at the Ohi nuclear facility along Japan’s western shoreline, those workers went through the technical steps to reboot a reactor, the first to come back online since last year’s massive nuclear accident at Fukushima Daiichi. The restart at Ohi — with potentially more to follow — will avert dire power shortages and sustain the economy, Prime Minister Yoshihiko Noda has told the nation. But the restart also has divided the country, staging an increasingly hostile showdown between the government and those doubtful about its atomic safety claims. Some political experts thought Noda’s announcement two weeks ago about the restart of two reactors at Ohi — the No. 4 unit is scheduled to restart later this month — would quiet public opposition. Instead, Noda’s announcement fomented it, and social media-organized protests that once drew hundreds now draw thousands. A Friday rally in front of Noda’s office drew 17,000, according to police, though organizers put the number around 200,000. The central government has so far given no indication that the public display will cause a rethink of its nuclear restart efforts. Wide-scale protests are rare in this country, where people traditionally comply with authority figures, and Noda, who is also pushing for a consumption tax increase, faces a backlash for his pro-nuclear stance. In a Pew Research Center poll earlier this month, 70 percent of Japanese said they favor a reduction in the country’s reliance on nuclear power. The government, before calling for the restart, received approvals from local and regional officials near Ohi, a process that required months of persuasion. Engineers at Ohi planned to pull out the control rods that prevent nuclear fission on Sunday evening. By Wednesday, according to Japan’s Kyodo news agency, the 1,180-megawatt reactor will begin transmitting power. Before the series of meltdowns at the Fukushima plant, which forced the evacuation of more than 100,000 people, Japan depended on its 54 reactors for roughly one-third of its energy. But in the wake of the accident, those reactors steadily went offline, either because of safety concerns or for routine maintenance checks. In early May, the final reactor in Hokkaido went offline and the country became briefly nuclear free. Noda became a voice for the restart, and last month he said that a failure to restart the reactors would jeopardize life as Japanese knew it. The government forecasted energy shortages during the sweltering summer — nearly 15 percent in one region, known as Kansai, that had been particularly atomic-dependent. Japan picked reactors No. 3 and No. 4 at Ohi as the first to restart because they supplied the Kansai region and because they had already passed stress tests to gauge their response to disasters. The restart comes at a time when policymakers here are planning the country’s energy future. The so-called Energy and Environment Council is debating three options: By 2030, nuclear power will account either for 20 to 25 percent of Japan’s total electricity share, 15 percent, or zero percent. The council is supposed to reach a decision in August, Japanese media have said. Well, workers had to take a ferry boat to the plant. And "months of persuasion" is an obligatory tap dance, so to speak, to give the impression to the gullible public that it has been a hard decision. Washington Post should know, as it is the same in the US. If the writer, who is based in Tokyo, had spoken with protesters anywhere in japan, the protesters would have told him that they'd rather have a rolling blackout or rationing than the restart of nuclear power plants. It rained all day, on both the protesters and the police who had to guard the plant. It is a little confusing, but from bits and pieces on Twitter, it looks the police, after trying to forcibly remove some protesters who entered the plant compound, decided to withdraw. The protesters, particularly the younger people who had taken turns to protest for 2 days and nights, decided to take a break and withdraw themselves. The protest ended peacefully. There is a report of one arrest, and an allegation that one protester was kicked by the police. If the latter is true, it should be all captured in the live video. 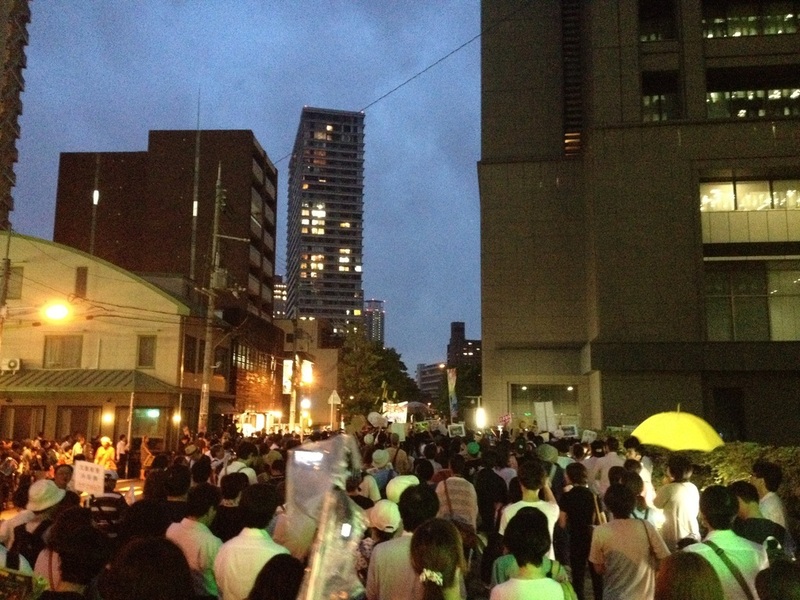 Here's one photo (by Megumi Ikeda) of the protest on July 1, when the rain was particularly heavy. Many in Japan sympathize with these young men who have to stand guard. They look miserable in the photo. An interesting piece of information from Yasumi Iwakami, who went there on July 1: The riot police was not local but brought in from Aichi Prefecture, where the governor is determined to at least bury the ashes in landfills in Aichi after the disaster debris is burned elsewhere. Since it was pouring rain, the reporters from the major news outlets hired taxis to the protest site, and remained in the taxis to file their report on their PCs and take a nap. One of the protesters look at the taxi meters - 78,000 yen (US$976), 44,000 yen (US$550), 27,000 yen (US$338). In this age of the internet, social media and mobile smart phones, you can't get away with doing what you've been doing . Jiji Tsushin (7/1/2012) reports that the Senior Vice Minister of the Ministry of Economy, Trade and Industry arrived at the plant by sea, on a ferry boat, to bypass the protesters. 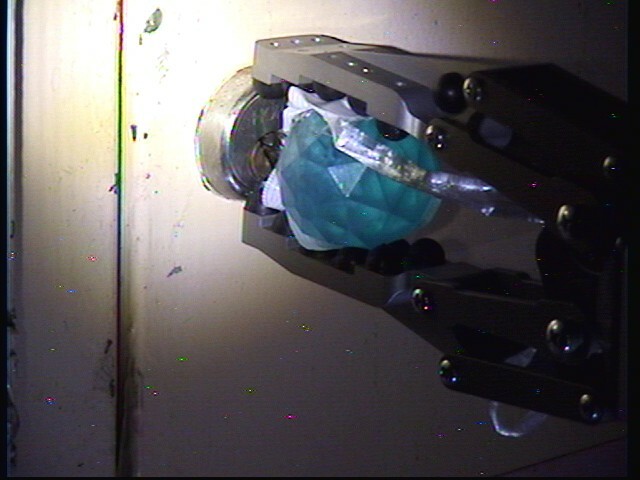 Senior Vice Minister Makino was on hand to remove the control rods from the reactor core of Reactor 3 at the plant to start the chain reaction.